Heritage is the key driver behind Simoniz’s new black and gold rebrand. 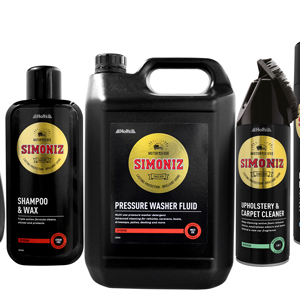 The change and re-livery of its products is harking back to the days of Simoniz’s iconic Original Wax gold tin, as it looks to continue its sales drive in the UK. The revamped packaging will also see the introduction of easily identifiable colour coding, with red, green and blue representing exterior, interior and wheel and tyre product ranges respectively. To spearhead the rebrand, Simoniz will also be launching a new non-acidic wheel cleaner to the market. The Alloy Clean Plus will allow users to quickly remove traffic grime and brake dust from the wheels, and thanks to its unique formulation it won’t degrade the surface of the alloys, brake discs or tyres. The product is safe enough to work on damaged alloys whether they have been scuffed or suffer from blistering or bubbling lacquer and paint finish.